"Comunicació Institucional: un joc d'estratègia". This was the title of the LAB IDEAS workshop at Campus Gutenberg 2018, which Anna May Masnou, Communication Officer at ICMAB, organized together with seven other Communication Officers of research centers and institutions of the UAB Campus: Alexandra Canet (CVC), Àlex Argemí (ICN2), Pere Figuerola (ICP), Sebastián Grinschpun (IFAE), Isabel Lopera (ICTA), Ona Tribó (PRUAB) and Gemma Ortiga (PRUAB). 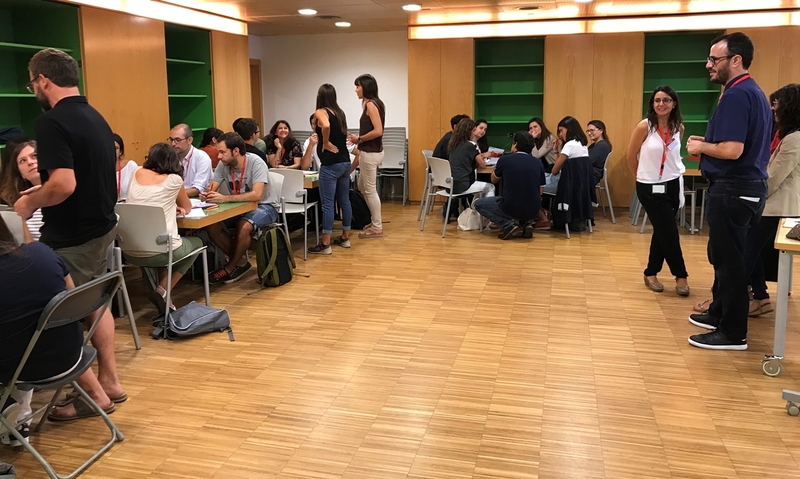 25 participants, from diverse background in the field of science and communication participated in this "role play" workshop of the Campus Gutenberg in CosmoCaixa. Each group (5-6 people) represented a new Communication Department on their first day on a research center. Their mission was to prepare a Communication Plan to increase the visibility of the center, taking into account the indications of the organizers. The eight organizers assumed each one a specific role in the game: the Director, the Manager, the Tech Transfer Officer, the Project Manager, the Webmaster, a Star Researcher, a Non-communicative Researcher, and an Enthusiastic Postdoc. Which instructions do the participants have to follow? Who is the one taking decisions in a research center? Is there any budget to do some activities? How should the communication department deal with all the different types of researchers? Are there other ways of communicating apart from the classical newspapers? The objective of the workshop was to think about all tasks existing in a Communication Department of a research center or institution: internal communication, news and website, social networks, relationship with the press, organization of events and seminars, outreach activities, etc. and to think on a proper strategy to increase the visibility of a research center in the XXIst century by combining them in the best possible way. It is the second year that the UAB Campus Communication Officers get together to participate at Campus Gutenberg with this type of workshops, which have resulted always in a positive experience, both for the participants and the organizers.